The life cycle of the salmon is a remarkable event, which enriches the lives of all of the Yukon’s inhabitants, both human and animal. Bear, eagles and many other birds and predators depend on salmon for their survival. For thousands of years, humans have also relied on salmon for food. 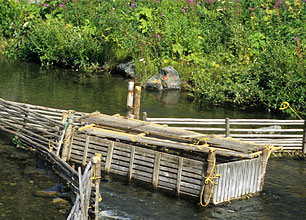 At present, salmon continue to sustain a myriad of human activities, livelihoods, businesses and ways of life. Salmon fishing is also a popular recreational activity that brings tourists to the territory and enriches Yukoners’ quality of life. The goal of the Salmon Sub-Committee is to preserve salmon stocks in the Yukon Territory in order to maintain this vital part of the Yukon ecosystem, economy and lifestyle. The Salmon Sub-Committee meets throughout the year to study, discuss and make recommendations considering vital salmon stocks in the Yukon. To ensure the continued well-being of Salmon populations in the Yukon for the use and enjoyment of all Yukoners and future generations while protecting First Nations special interest in fishery. Make recommendations to the Minister on all matters related to Salmon management. The Yukon Salmon Sub-Committee will work within its mandate towards achieving the objectives of the Umbrella Final Agreement established in Chapter 16 Section7.17. These general objectives related to the management of salmon in the Yukon provide the broad policy context for the Sub-Committee. may make recommendations on management measures required to best ensure that the basic needs allocation of a Yukon First Nation is met, recognizing that resources available for fisheries management may be limited.